Go on the Go is a portable urinal that you may want to use for music festivals, outdoor activities, road trips, waiting in lines, car sick kids, or a number of other uses. Go on the Go Portable Urinal. Portable urinals can be very handy to have around. There are a ton of situation in which they might come in handy. Peeing in the tent at night when it’s cold or raining. If you’re looking for a portable urinal, Go on the Go makes a nice choice. It’s small and light in weight, making it possible to take one with you just about anywhere you go. Keep one in your glove compartment, small boat or plane, backpack, or purse. If you don’t have access to a toilet, or only have access to a disgusting one, peeing into this disposable urinal can make a better choice. It’s easy to use for both men, and women, and it allows women to pee while standing up. The best part is that Go on the Go locks in odours and smells. The crystals turn into gel when exposed to liquid. The volume indicator on the bag allows you to see how full it is, and it’s possible to get multiples uses out of it. Another reason to consider a portable urinal is if someone in your family gets car sick. Instead of puking into a bucket, try Go on the Go. The main benefit is that the car won’t stink after this happens. Plus, it packs up very small and it’s easy to put in the back of a seat pocket or glove compartment. We LOVE Go on the Go Disposable Urinals and we’re confident that you will too. Find out how to buy them below. It can be difficult to find female urination aids in stores. If you do want to, check out the local outdoor shop and they may have 1-2 brands on the shelf. Excellent customer reviews and ratings on Amazon (often better than the Travel Jane for example). “I drive a limo for a living, and love to have a few of these in the glove compartment if one of my passengers starts to get car sick. It prevents a whole lot of clean-up for me later. The best part? The crystals turn into gel that locks the odour in, so the rest of the passengers don’t have to suffer (including me). Bit of a learning curve to Go on the Go. I peed on my pants a couple of times, but figured it out eventually. If you’re looking for disposable urination aids, then look no further than this handy comparison chart. We’ve down the hard work for you and narrowed down your choices to the best ones, including Go on the Go. Depending on what kind of pee funnel you use, there can be a serious learning curve to them. Something like the Pibella, which is a small tube that fits under your urethra can be more difficult to use than a device with a big funnel. What about Reusable Pee Funnels? There are a number of advantages to disposable urination devices such as this one from Go on the Go. They’re convenient, easy to use and lock away odours. However, the biggest advantage is that they collect the fluid (urine or vomit), instead of just directing it like regular pee funnels. This means that you can use them inside a tent, car, or plane. Or, even when standing in line waiting for something. However, portable, disposable urinals also have the disadvantages of being quite expensive if you use them a lot, as well as not being great for the environment. If you’re looking for a portable urinal that collects the fluid in a bag, then Go on the Go might well be your best choice. There are a few competitors, but Go on the Go has some of the best user reviews and ratings. As far as our experience goes, we found Go on the Go to be light in weight and compact enough to bring just about anywhere. It’s reasonably easy to use for both men and women. However, it’s best if you use it while standing up. Gravity is indeed a thing, and it can be quite difficult to pee into a pee funnel type device while sitting in a car, or laying down on a bed. It’s not impossible, but will require some serious practice and skill to not pee all over yourself. The product comes in a pack of 6 for a very reasonable price, and also includes 15 wipes for the complete bathroom experience. For the price, it’s certainly a win and worth a try. 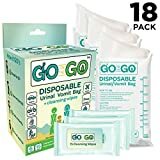 Where to Buy the Go on the Go Disposable Urinal? 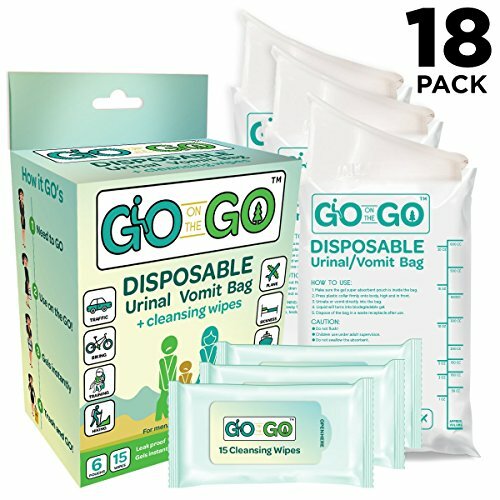 Go on the Go Disposable Urinal: Have your Say! What are your thoughts about this disposable urinal for men or women? Leave a comment below and let us know your thoughts. Is it a winner, or are you considering another brand?